Game developer conference Unite Europe took place on May 31 in Amsterdam, with about 3,000 attendees gathering to discuss the game industry’s latest trends and future prospects. The conference will be held until June 2. Unite is hosted by the famous 3D game engine company ‘Unity’, and is the world’s largest series of mobile gaming events. Unite conferences are held at various cities all over the globe. Previous Unite Conferences have taken place this year in Tokyo, Seoul, Shanghai and further events are slated to take place in Brazil, Southeast Asia, United States and Australia. This year, Samsung, one of Unity’s strategic partners, participated in Unite Europe to showcase Tizen platform and to encourage developers build Tizen apps using unity game engine tools. From the event, Samsung presented a special session ‘Bring Your Games to Tizen’ introducing how to port Unity game apps to Tizen platform using Unity game engine tool and its SDK. 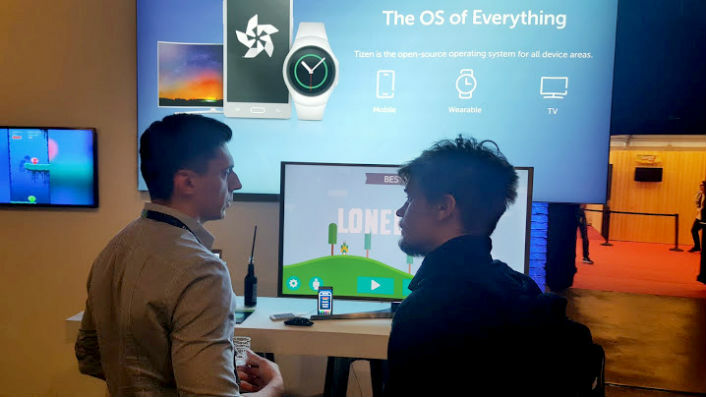 Attendees visiting Samsung’s booth were given the chance to try their hands at Tizen Unity games including Lonely One, Angry Bot and Sub Explorer on Z1 and Z3 smartphones, Samsung Smart TVs and even Gear S2 smartwatches. Samsung last year launched the first Tizen smartphone, the Z1, for the Indian market. Its release was followed by that of the Z3, which has proved popular with Indian smartphone consumers. Samsung also held a Tizen Developer Summit in Bengaluru last year with the aim of establishing a shared Tizen ecosystem for Indian developers and partners. I did not login in this app. Why?